Why Buying Green Is Not Always Eco-Friendly. You’ve seen the ads on television, in magazines, an at the mall. “Go Green” by purchasing this reusable bag! Be more “Eco-Friendly” by picking up one of our 100% recycled-plastic doo-dads! “Love the Earth” by replacing your t-shirts with new designer-brand organic cotton ones! The greenwashing of our retail world knows no bounds, as major corporations jump on the green bandwagon and market products that most of us aren’t interested in, nevermind even need. They have assembled teams of charlatans with the goal of tricking you into buying products you don’t need just because the product is “green” – and they are very good at their jobs. Don’t fall for it. Don’t let them get you. If you do not need an item, you definitely don’t need a green version of it. If your bookcase or desk still works just fine for your needs, you don’t need to replace it with one made from sustainably-sourced hardwood from a local supplier. The one you have is perfectly good, doesn’t require any new materials to be harvested at all, and won’t end up in a landfill. Imagine if everyone replaced the items they already own with new eco-friendly versions. What a mess that would make, all in the name of going green! A few years back I received a press release about a “green” mansion that some billionaire was building. Reading the specs I kept saying to myself that there is no way this house is green. A giant pool, waterfalls, a 7 car garage, a dock for a yacht, 11 bathrooms, and 15,000 square feet of living space. How in the world is that considered green? Because it has a few solar panels out back? That’s the furthest thing from green that I could possibly even imagine, yet here was this PR puppet sending out information to green bloggers in hope of getting coverage. And you know what? She got it, and not from just a few sites. Many covered it without nary a mention of greenwash or the hypocrisy of it all. That’s frightening. And it’s not a welcome trend. I am all-too-often hearing fellow eco-writers talk incessantly about all the swag they picked up at one of the many “green” conferences they attend each year. Pens, bags, pins, stickers, frisbees… When did they stop being environmentalists and become swag hoarders? Just because something is free does not mean one needs to take it, especially if it’s nothing needed nor useful. There is nothing green about that at all. The word “green” has become a catchall term without much meaning anymore. “Buying Green” is even worse; just the fact that we use that phrase kind of takes away from what green used to mean. Yes, we can buy more eco-friendly products when we need them. But buying and replacing just for the sake of buying green is the complete antithesis of what the movement is all about. It’s about reducing, reusing, repurposing, recycling, and regifting – not shopping. If I am replacing something I already own, is the one I have working just fine? What will I do with the old one? How much energy is exerted to make the “green” version? How far away was it made? Am I falling for greenwashing? Is this bringing value to my life? And again, do I need it? No one will ever begrudge you for buying what you need. And when you buy what you need, look for an eco-friendlier version. Need a new lightbulb? Buy a CFL or an LED bulb. Looking at new cars? Why not take a gander at a new hybrid from Toyota or Honda. Out of batteries? Pick up a set of rechargeable batteries that will last you at least 5-7 years. We all need to shop and purchase items once in a while; it’s to be expected. But if you are buying green to replace something that doesn’t need replacing, or even worse buying something you don’t even need, you aren’t doing the planet nor the environment any good. Not all “green” is created equal. So readers, have you replaced perfectly good items in an effort to be green? If so, what did you replace? Or, if you have gotten free stuff, how much of it have you actually used? I always wonder about that. I figured that I companies/ people just jump on the going green bandwagon as a marketing tactic to gain sales. Awesome! 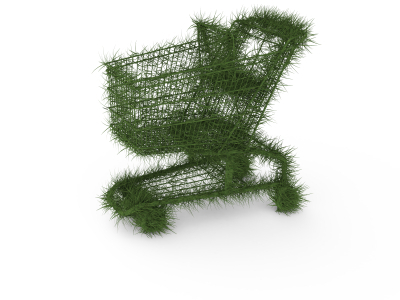 I think the greenest consumer is the one who consumes the least, and who buys new items only as a last resort. If only we could all be like that. We would all be rich. Intent is always important to discern. And the reusable bags are better even if they’re made in the same factory as the single use bags because even if you only use them ten times you have saved nine single use bags. Well said. Simple math proves the efficiency. I could not agree more! GREAT post that should be read by EVERYONE! My sister rants about this a lot and has since made me a ranter about it, too! Greenwashing is a real thing. And,when peopel go out to buy a new hybrid car because it’s better for the environment than their current car, it’s absurd that it never occurs to them that the production of a hybrid car is less green than keeping the non-hybrid but already produced car that you already have! Only get a new “green” product when the one you already have (even if not ‘green’) is no longer functional. Excellent excellent post. Great point – unless of course your existing car is from 1985, emits a ton of blue smoke and gets 6 MPG. Then it may be worth it! I wouldn’t dare waste money on something just because it’s “green.” A lot of products that are supposed be green or made from recycled materials are ridiculously priced as well. I care about the environment but not so much I’m willing to sacrifice my savings. I’ll do what I can, but I won’t pay a premium for green products. The best thing you can do is reduce your consumption. You (and the environment) are also better off picking up someone’s throwaways from a website like Freecycle. I will pay more for green if it is replaces something broken or is something I need. That way I spend my money for something better than what I had that will also benefit the environment in the long run. Reusable bags are always more eco-friendly than single-use, disposable ones, regardless of how they are made. They last for years and years and can replace tens of thousands of plastic bags each. You’re right. There has been awareness come out of the green washing. It has gotten people thinking about they are buying which is a huge step. I see a lot of subconscious shoppers out there who have no idea what they spend their money on. Very good advice. I try to only buy what I need, and I do go Eco-friendly when I do that; even with my food. But even I sometimes fall for the gimmick of buying something just because it’s ‘green’. I will definitely stop and ask myself those 10 questions from now on before making a purchase. What about buying organic? The FDA has not defined what organic means, so you are paying more for something that may not meet your definition of organic. Good point. This is why I like talking to the distributor myself to find out their farming practices. That way I can make an informed decision. Interesting post and common problem. Random facts – the VW diesel Jetta has equal fuel efficiency to the Sonata hybrid! Plus, when you compare it to electric cars, most people like to ignore the source of electricity, which can be really terrible in some locations, especially those running on thermal coal. Interesting. I didn’t know that about those cars. I also didn’t know about these shoes. I am going to check them out. I am a runner myself. This entry makes clear a very serious problem that adds confusion to the emerging “green” culture. We are a college startup specializing in green advertising and working to rid people of this confusion. please take a look at our blog, leave comments and suggest other blogs for us to look at! Thank you all! Check out Reduce Footprints. They have a great list of green blogs. Thank you for this post. Sometimes I think that people think that being green is just another form of keeping up with the Jonses. Buying from clothing and furniture from a thrift store or estate sale is much more green than buying new. Like you said, it keeps stuff out of landfills and since it has already been made you don’t need to cut down a tree or cart it halfway across the world. It’s true. You could spend a fortune on buying all new eco stuff but what do you do with the old stuff. I like to reuse as much as I can.